I have spent the last two weeks reading a book on Sony's two newest Readers, the Touch and the Pocket editions—one is overloaded with tricks but killed by glare, the other is simplified past the point of goodness. What is an ebook reader? It is your relaxation companion, the screen you will stare at when the laptop is closed and the TV is off. In that sense, the ability to provide tranquility must always trump the latest trick. 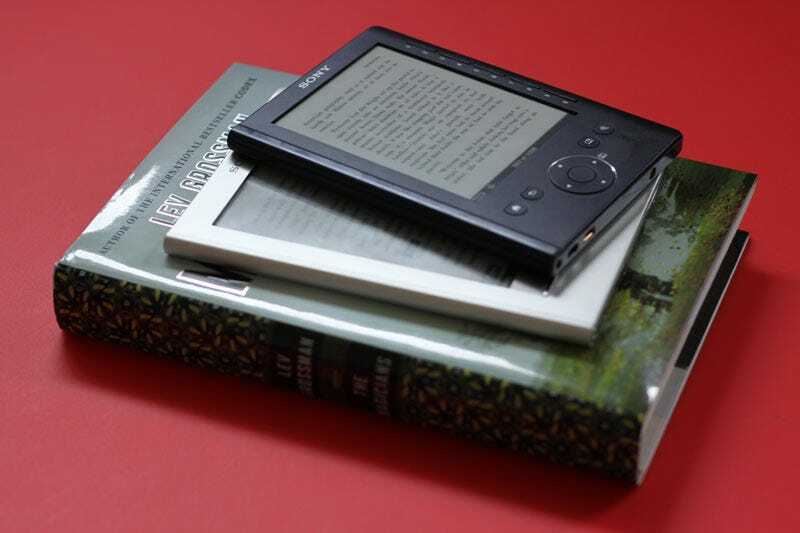 Pack in touch screens, pack in SD card readers, search, dictionary, library-book borrowing. You can pack it all in, but never, ever at the cost of that primary role. With the $300 6" resistive-touchscreen Touch Edition, Sony fails to heed this simple agenda. With the super-simple $200 5" Pocket, Sony seems to be flaunting it. Mind you, neither are Kindle killers, but they never were supposed to be. They are cheaper than Kindle, in a niche all by themselves. They represent Sony's third try at elusive ebook reader success, using its own bookstore and the necessary computer connection instead of pairing with a retail giant and a 3G wireless provider. Speaking of that, Sony takes on the now $300 Kindle with its $400 3G-capable Daily edition, which we hope to review in the coming months. The Touch, which I've been using primarily, has a lot of flaws but battery life isn't one of them: I charged it 11 days ago, and it's only now starting to die. The touch interface provides a relatively organic way to turn pages, though I always flick in the wrong direction. (You push your finger towards the next page, rather than flicking the current page back.) Update: You can set the turn motion to go either way. Thanks Weatherman! When you tap words—with a fingernail or the included stylus—you get an instant dictionary definition, and a quick way to search an entire tome. The interface isn't going to win any awards, and the dictionary doesn't know a lot of words that it should, mainly past participles ("overheated") or gerunds ("deteriorating"). But if those were the only issues, I'd say jump in—it's a nice enough player priced well under the Kindle. But the screen, oh God, the screen. Sony's problem with glare continues unabated, and because the soon-to-be-launched 3G-connected flagship Daily edition also has a touchscreen, the glare problem is likely to sink that as well. What do I mean by glare? I mean that, lying in bed, with just my reading light on, I can see the perfect out line of my face. Sure, I am handsome, but when I read a book, I expect to be staring only at words on the page, not my own lovely mug. In a well-lit room, the glare from all sides is positively frustrating, and it shifts with every minor adjustment of my hand. More and more LCD screens on laptops come with glossy finishes, and that can be a pain when you're surrounded by natural light. However, LCD is back-lit. The light coming from within the screen combats the light bombarding it from outside, so you can still see a lot, and you can always jack up the brightness when you can't. E-Ink isn't backlit—that is its benefit. When done right, it looks like paper, with zero eye strain. But if you put a shiny membrane over that E-Ink, as Sony has done here, you get undefeatable glare—and eye strain galore. When I brought up this problem with Sony, they told me that touch was a huge selling point for focus groups. I can appreciate that, and can see how Sony thought this product "tested well," perhaps in a setting where people are not reading for hours (or days or weeks), but are just messing around with the neat-o gadget. Also, anyone who only has the experience of the Touch edition may not realize there's a whole world of glare-free ebook readers, from the Kindle to iRex's Digital Reader, which actually has a touchscreen. It's too bad Sony couldn't figure out (or buy) iRex's secret. The people in the Touch focus groups should have been given a Pocket Reader too, as I was. Literally pocketable and way cheaper, the Pocket is far more capable of delivering hours of peaceful reading. As you can see in the images, side by side, the screens couldn't be more different. It's not just relatively glare free, it has better contrast for even easier reading. The Pocket's problem is that it is barebones to an almost insulting degree: No search, no dictionary, no card reader, no nothin'. I could actually live without all of those features save one: Search. Keyword searching is to future readers what leafing around is to current ones. Don't remember where you last saw the mysterious man in black? Do a quick search. The Pocket has bookmarks, so you can dog-ear the pages you want to remember, but search is about not having to remember—it's about hindsight, not foresight. In the end, I can't recommend either device wholeheartedly, but I can tell you that if you plow through books fast and dirty, without jumping around a lot, you could do worse than drop $200 on the Pocket. It's simple, it's easy on the eyes, and for the time being, it's the cheapest ebook reader out there. Add to that this lending-library feature that hopefully launches soon, and you could get the first reasonably budget reader. Glare glare glare glare glare... and did I mention the glare issue? The book I was reading is The Magicians by Lev Grossman. Lev happens to be an old friend of mine, but I'd recommend the book regardless, an R-rated post-Potter tale of a teenager's induction into a magical university, fast paced and full of great insider references not just to Rowling but Tolkien and CS Lewis as well.